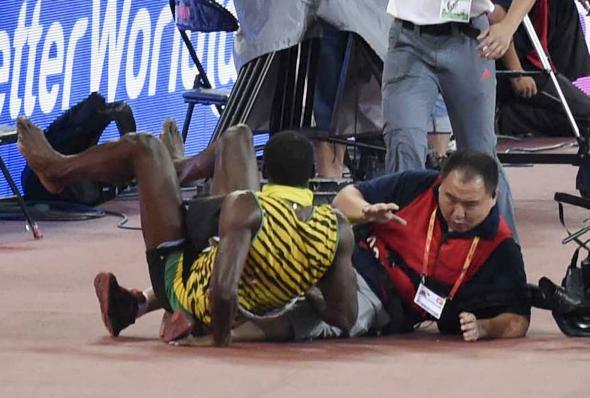 Usain Bolt knocked over by Segway: Jamaican champ felled by surprise attack. The great Usain Bolt won the men’s 200-meter race at the world track and field championships in Beijing on Thursday in 19.55 seconds, his 16th gold-medal performance in a world championship or Olympic final. Shortly thereafter he was viciously attacked by an out-of-control cameraman on a Segway. Bolt got up right away, remaining in high spirits as usual, and doesn’t seem to have been injured. We’ve all been there, haven’t we? Strutting about like we’re on top of the world when, metaphorically, a camera guy wearing jorts careens into our knees because his wheely-machine hit a railing. You never know what life is going to throw at you next, whether it’s a rainy day, a sudden crisis at work, or a guy on an out-of-control future-gizmo taking out your legs after a race in China. You just never know.